Tummy's Guide to the Dining Hall | A survival kit for eating in college. A survival kit for eating in college. Hello! Welcome to my blog about food, travel and more! Every recipe you see on this blog has been made at my university’s dining hall or at my home. I cook whenever I have time and thoroughly enjoy the experience of cooking with my family! Click on “Recipes from College” to see dishes that I have created at my university’s dining hall. Click on “Recipes from Home” to see other recipes I have made. To receive recipes, enter your email below the button that says “Follow this Blog” (found on the top right side or on the bottom of this website). I hope you like what you see and happy eating! 😀 Scroll down to see more! I had the chance to create many different dishes this past summer, but this one is by far my favorite. I took advantage of what summer has to offer: Californian figs and nectarines, paired with balsamic glaze. 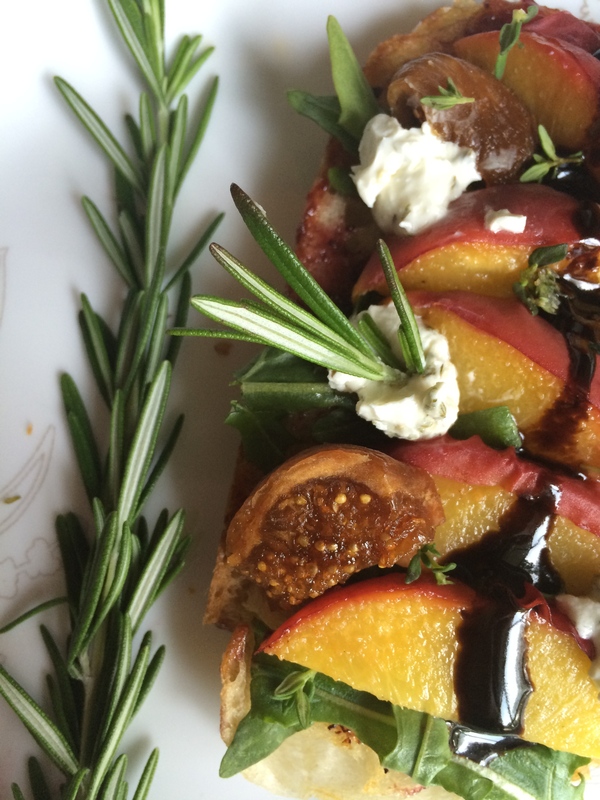 The slightly tart balsamic glaze goes perfectly with the sweet figs and nectarines! This open-faced sandwich can be a quick snack or a light lunch for a busy day. Although it may look fancy, it is extremely easy to prepare. Please do yourself a favor and treat yourself. Need a cute but chic appetizer for your next gathering? I’ve got just the thing for you. Make these mini savory and sweet toasts and they’ll definitely be a hit with the crowd. Each type of toast only requires 4 different ingredients, and what better way to celebrate summer than with simple and colorful little appetizers? The crunchy toasts pair perfectly with the cooked veggies and Trade Joe’s balsamic glaze. Well, what are you waiting for? Invite some people over and impress them with this delicious appetizer! Just had pani puri yesterday? Use the leftovers in a Bombay Sandwich! This sandwich is easy to assemble, especially if you have a few ingredients prepared from the day before! Plus, you can layer the ingredients as high as you want for a heavier lunch. Take a break from paninis and hot subs with this classic Indian sandwich that is commonly found in Indian street food culture. A cold and delicious sandwich on a hot summer day? Yes, please! With only 4 ingredients, this crispy bruschetta is easy to make at the dining hall and tastes delicious. The nutty taste of the pesto is more flavorful after its been heated since the taste infuses throughout the oil. The pockets within the rosemary bread soak up the creamy pesto, creating a beautiful color and providing flavor in every bite. In addition, the tomatoes add some freshness and color to this bruschetta. Top with a bit of shredded mozzarella cheese, bake in the oven for 60 seconds, and enjoy your meal made in under 5 minutes! Brunch is definitely my favorite meal of the day, mostly because it involves having some type of comfort food! I had a little extra time to myself this past weekend since I don’t have any tests coming up, so I made a warm toasted flatbread in my dining hall. I chose to use only eggs, tomatoes and provolone cheese, but you can really choose any type of vegetable and cheese to go along with the bread–simply toast the entire flatbread and the melted cheese will satisfy your craving! Want new recipes every week? Follow this blog or enter your email below! Want new recipes every week? Enter your email below! Looking for something specific? Click on a tag below! Johnny griddle cakes should be a national dish ✨ Thanks to Blue Sage for this refreshing dessert with tangy raspberry sorbet and crunchy granola pepita. I've never tried something like this before, I definitely recommend going there if you're looking for vegetarian or vegan dishes! All of their meals are meat-less.